If you’ve been out to Deer Creek Center in the past few years, you’ve probably noticed the fenced area the size of a house filled with sprinklers and heat lamps. It sits in the pasture next to the gravel road shortly after you turn off Illinois River Road. 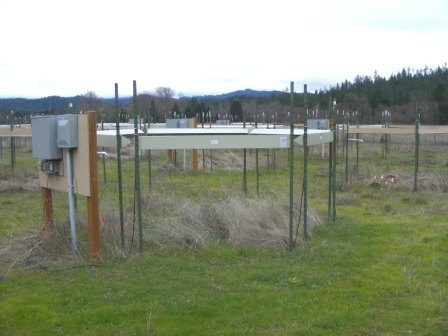 This enclosure is one of three facilities in the Pacific Northwest that comprise a study designed by ecologists Scott Bridgham and Bart Johnson of the University of Oregon. Their research is attempting to answer two questions: How will climate change affect native plants in imperiled prairie ecosystems? How certain restoration practices might be in protecting these ecosystems as climate change progresses? To answer these questions, these scientists have established three research locations: Deer Creek Center in southern Oregon, and on preserves managed by The Nature Conservancy near Eugene and in western Washington. In each of the three enclosures are a series of treatment and control plots. In the treatment plots are either heat lamps, sprinklers, or lamps and sprinklers. The purpose of this hardware is to simulate the warmer and wetter conditions predicted for the Pacific Northwest. The rate of plant growth in the plots helps determine how the plants are likely to fare under climate change. We managed to catch up with Scott Bridgham by phone earlier this week. He and Bart Johnson are currently writing up the results from the initial phase of their research. SFI: Why the focus on prairie ecosystems? Bridgham: Grasslands and associated open areas—which would include things like oak savannah—were (once) a predominant habitat type from southwestern Washington south of Seattle all the way down into Northern California. Many of those open ecosystems have been lost, depending on how you define them, only 1 to 10% of them are left, so they’re considered one of the more imperiled ecosystems in the U.S. The reasons for loss have been myriad, some of which have been due to development and agriculture but one of the biggest ones of them have been succession to denser forest, often Douglas fir due to reduction in fire frequency with Euro-American settlement. They harbor many species, a few are rare and endangered species. Another problem in these ecosystems which is true in this part of the world and around the world, is the effect of invasive species in the native communities. SFI: What types of plants are you studying? Bridgham: They’re species that are range-limited to somewhere in the Pacific Northwest, sort of on this side of the Cascades. They include grasses and forbs, perennials and annuals, so a pretty big distribution of species with different life history traits… From a larger perspective this should be a pretty representative group of species that would occur in grasslands. SFI: So you’re looking at what happens when the temperature increases by 3 degrees Celcius and with an increase in 20% of the intensity of precipitation, both of which are what some climate change models are predicting for the Pacific Northwest. What have you found so far? Bridgham: The precipitation treatments have had very little effect in everything we’ve looked at, which makes for a short story. The warming is much more interesting. Much of its effect is actually in drying the soils . What we found is, interestingly, not species-dependent, which is—I was surprised—that the species with warming (treatments) do poorer in their current range, even if it’s at the northern edge of their current range. If we move them beyond their current range, they do fine or even better than they would have done further south in their range. It’s kind of what you’d expect but no one has ever done this experimentally, to my knowledge. SFI: So if these native plants can migrate northward as the climate warms, they’ll survive? Bridgham: The conundrum is, they’ve got to get there in a highly fractured landscape, because there are only islands of appropriate habitat that are, these days, very far apart. SFI: In your study, you’re also looking at restoration techniques aimed at helping these vulnerable native plants, primarily against the exotics. It seems like the exotic species do better in the warmed plots—which is not good. So there’s a pretty strong suggestion that with climate change these grasslands are going to be dominated more by these annual exotics versus a mix of perennial natives and exotics, which would be a pretty major change in plant functional group which has lots of implications. SFI: You mentioned that Oregon’s grasslands have been dominated, historically, by perennials. Bridgham: They were dominated by perennial native bunchgrasses. But when California was colonized way back when by the Europeans, they quickly introduced exotic grasses, so they have (now) been there for a very long time, and all their grasslands have pretty much dominated by annual exotic species with very few exceptions. SFI: So it’s not just people who are moving from California to Oregon! How are these exotics taking over? What’s happening, as it were, on the ground? Bridgham: Perennial plants and the annual plants, they have very different phenologies of how long they stay green, when they fruit. If there are closely evolutionary coupled cycles between species and their pollinators, then that can certainly be disrupted. SFI: Take us forward 50 years. You told me that perhaps 99% of the people may not be able to tell the difference between the current perennial-dominated Oregon grasslands and the exotic-dominated grasslands that may be here in the future. Bridgham: There are a lot of reasons that people give why you should protect biodiversity but it comes down, for me, to an ethical question: do we as humans have the right to decimate native fauna and flora? SFI: So climate change, at least in grasslands in our area, is likely to cause a loss in biodiversity? Scott Bridgham is a professor at the University of Oregon’s Center for Ecology and Evolutionary Biology. Image | This entry was posted in Uncategorized and tagged Climate Change, Deer Creek Center, exotic plants, native plants, prairie. Bookmark the permalink.